Clever or not, Sega's early 3D games with the Virtua brand, riding the virtual reality trend of the early 90's, offered some unique games. Clearly nothing to do with VR, but boasting some incredible 3D games that broke technical boundary after boundary of their time. 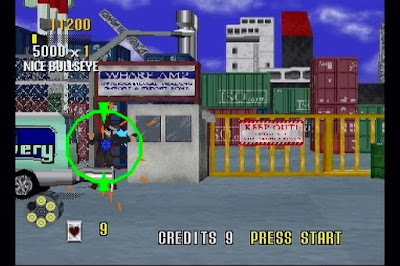 I'm here to talk about the Sega Saturn ports of two of the most famous light gun games ever created. 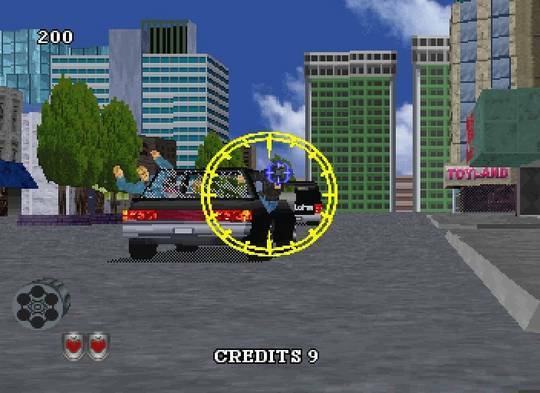 Infamous for it's badly ported launch line-ups of Sega arcade hits like Daytona USA and Virtua Fighter in '94/'95, the Saturn would save face and go on to receive faithful conversions the following year. While Sega Rally Championship and Virtua Fighter 2 are famously excellent ports of their time. Despite the huge difference between the low-end home consoles and the expensive custom arcade system boards, they built the games to take advantage of what the Saturn offered and re-code them to better optimise the hardware. There are a couple of other arcade conversions that really deserve some attention too. Namely Virtua Cop and Virtua Cop 2. Sega's Model 2 arcade circuit board. Probably the most important arcade board ever produced. If you never played on one of these fine pieces of hardware, well then you simply didn't live the nineties like you should have! Built by Sega in 1993, though planned as early on as 1990, in a collaboration with an aerospace company(! ), which later became a part of Lockheed Martin, head engineer and famous Sega employee; Yu Suzuki created the follow up to their first 3D powered hardware that was the Model 1. 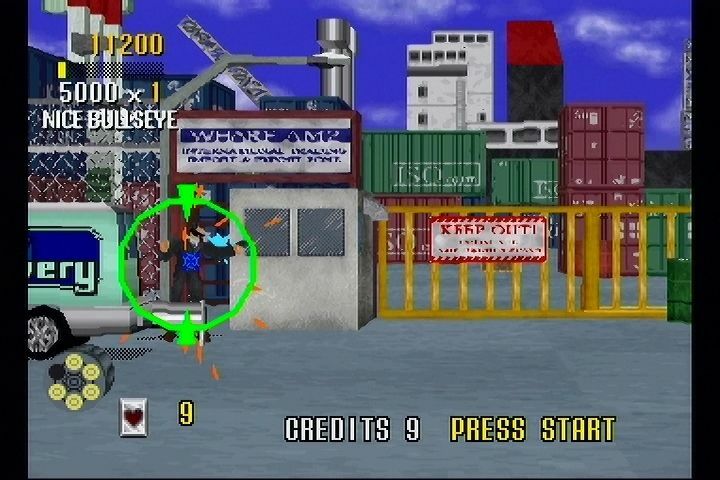 The original Model 1 arcade circuit board was only capable of making texture-less polygon environments at it's launch in 1992, however the following year Sega aimed for fully textured polygons and released the superior Model 2 arcade system board. So advanced was Model 2, it took five years for PC graphics cards to finally catch up with it in 1998. Five years. Oh, and by 1996, Sega had further moved on their technology and released the Model 3 hardware, pushing technology boundaries even further! Making it into the early 2000's before anything released for the home market even came close. So yes, while you were still playing the low-res Tekken 2 on a PS1 in '96, you could've played Virtua Fighter 3 with PS2 level graphics on the Model 3 hardware in the arcades the same year. Think about that for moment. For those that actually did this, then yes, your mind was blown. Going back to Model 2 though, Sega struck arcade gold with this piece of hardware and released many games from '93 right up to '98 on the platform, even though the superior Model 3 hardware emerged in '96. This made Model 2 the most produced and successful arcade hardware ever created. It amounted to a revenue of 3 billion dollars for Sega, selling over 130.000 units. Now there's a quality platform line-up you don't see very often! Normally I purchase older retrogames through Ebay, but recently for the first time, I used this retrogaming guy from Japan on Instagram. 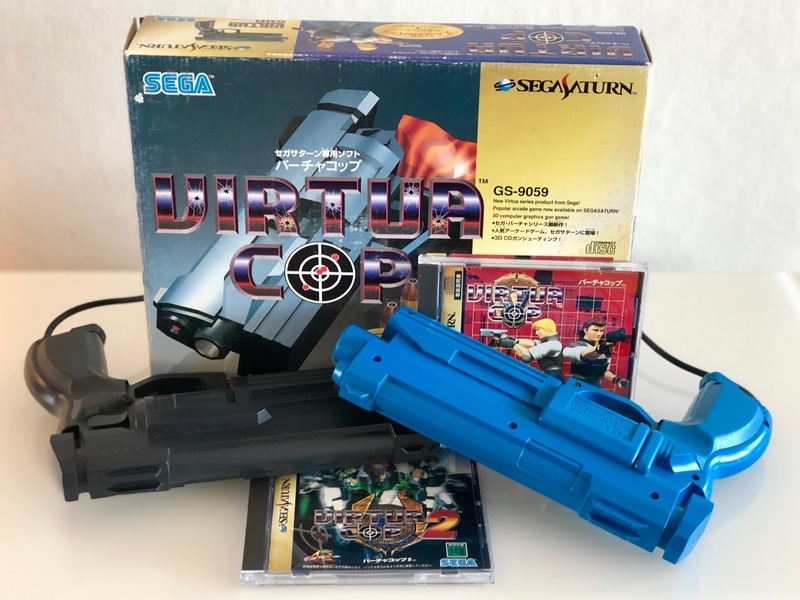 I purchased a boxed Virtua Gun, commonly referred to as a "Stunner", basically the Saturn's official light gun. 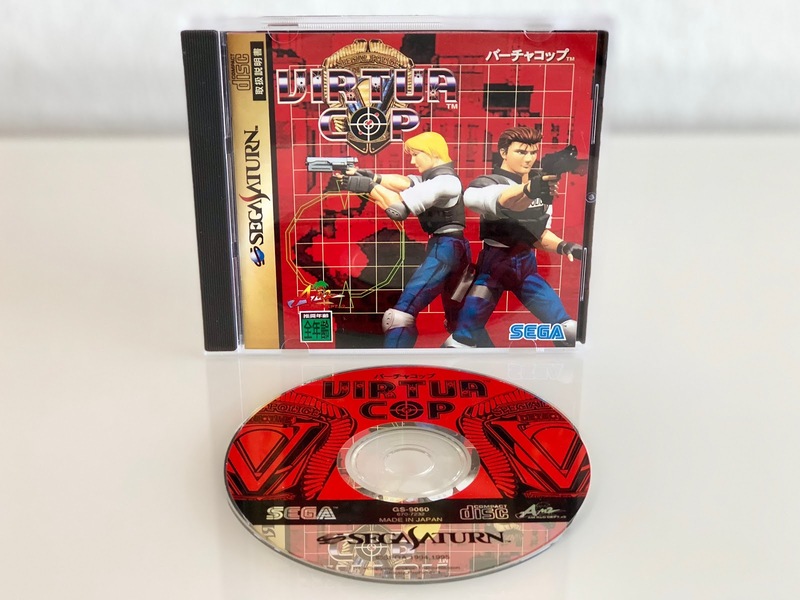 Also in the same package was the first Virtua Cop game, which belongs to the boxed gun, Virtua Cop 2 and the fairly bland arcade port of The House Of The Dead. The latter of which I may come back to at a later point, but for now I'm just leaving it mentioned here. Everything was in fantastic condition, especially the boxed games looked extremely well taken care of, with the CD's looking almost new. 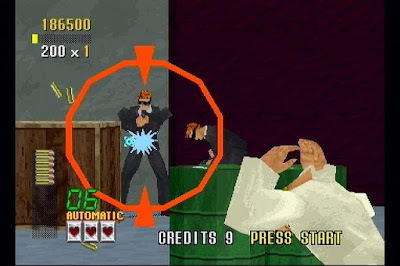 The Virtua Gun is a large light gun, it feels meaty in your palms, but is fairly light in weight. It has a simple start button on the left side to navigate menu options with. Precision seems fine and I had no issues blasting down enemies with it. I bought a second blue gun at a later stage too. These light guns require a CRT TV, as they won't work on modern flatscreen HDTV's. 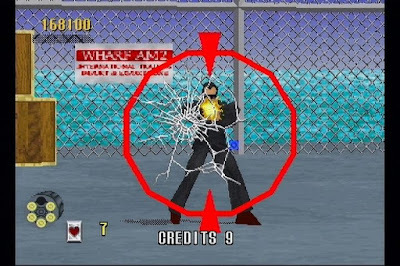 The classic light gun game that started it all in 3D, with it's iconic first shipyard level with a security booth and a large fence, complete with lots of baddies in black suits wearing sunglasses. 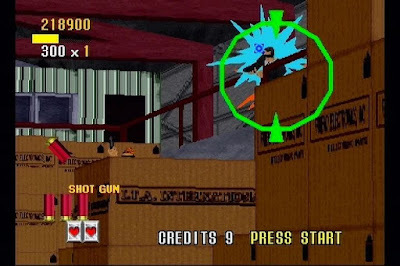 Huge aiming rectiles surround and rotate the enemies, as they slowly go from green to red and the camera zooms up close, giving the player a warning that they're about to fire at you. 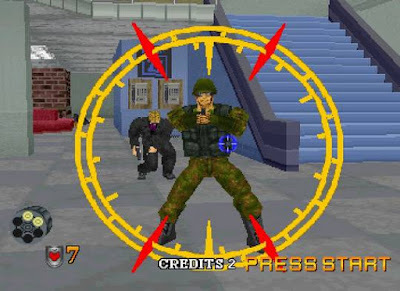 This zoom effect on enemies kind of defines the VC series and gives it a unique and recognisable design. It was a visual look later copied for the home market in Die Hard Trilogy. 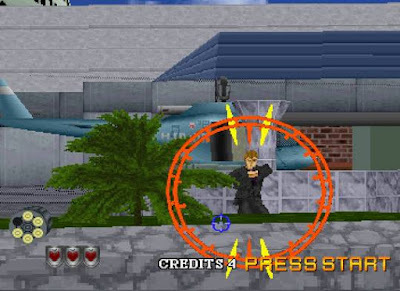 Namco's Virtua Cop copycat Time Crisis, which relies instead on a cover mechanic, owns a lot it's ideas from VC. 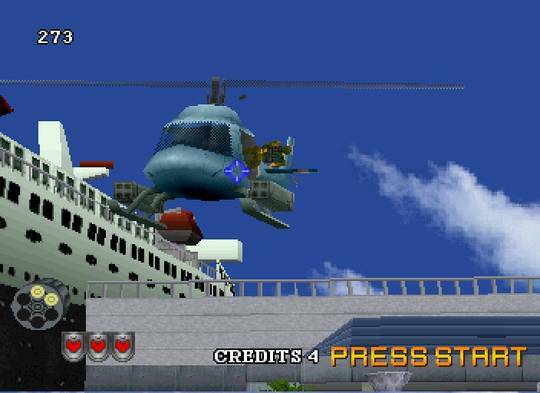 For the eyes of today VC1 features a very blocky polygon look, clearly showing it's an early Model 2 release. In fact, it almost looks more like Model 1 game with textures. However, the actual picture quality is extremely sharp on my CRT with and RGB cable from my Saturn. I am quite impressed how well they converted the game from the more advanced arcade hardware and made it look so alike. This is how a great conversion is done and what should have been done with Daytona USA and the first Virtua Fighter on the Saturn's release. VC is structured into three levels, with separate scenes within each one; beginner, medium and hard. On top of that, you can actually choose difficulty settings, lives and continues in the options menu. VC can be played by yourself or two player cooperatively (or dual wielding for the laughs). Each level has a pre-programmed route through it and ends with a boss battle. Beginner takes place at a shipyard with containers and warehouses. Medium is set in a open digging site with an underground facility, while Hard takes place at the gang headquarters, sporting an office building. Like most light gun games, VC is a painfully short experience. Each level taking 15 minutes tops to complete. It's a very set timeframe too, as the camera moves along constantly. The value for money and lifespan of a game like this is extremely cheap, but it's one of those arcade style layouts that begs for replays over and over. Making you try even harder to hit each enemy perfectly, and beat your last score. You need to see the game from the time period it released and the awkwardly short lifespan these early arcade ports had. It's not about the gameplay time of a single playthrough, it's about getting good at the game and repeating it to beat your last highscore. For the sheer entertainment of light-gun games though, VC holds up well and still feels fun to play. Even though the sequel is very close to the first game in structure, it's less square looking graphically and lends itself to the more accustomed look of later Model 2 games with more environment detail thrown in. There's a more ambitious cinematic style going on too, with small intro sequences for each difficulty level and character. VC2 just has a less early 3D and blocky animated appearance all around. The actual shooting seems a tad more precise and beefier when compared to VC1, at least when it comes to how the enemies react to bullets, giving a more weighty feel to the gun. It's nice and welcome upgrades all around. For a better value for money, VC2 features lengthier levels and route choices during each of it's three difficulty stages. There's even an extra Saturn exclusive route in the last Hard stage not seen in the arcades. These routes make replaying each of the levels more interesting, adding much needed replay value. I like how the game more prominently features it's main characters too, personalising the game more with it's three gun swinging cops; James, Michael and Janet. I love the CGI intro and character art all around, it looks typically mid-90's arcade and gives me a nostalgic feeling. Once again we are treated to an excellent arcade port with a sharp, clean picture and vivid colours. It's impressive how they have represented the more heavy polygon visuals of the original arcade game here. It's clearly been treated to an excellent downport as the cutbacks on polygons and have not made the visuals suffer in any way. Both Virtua Cop games on the Saturn are perhaps the cleanest looking 3D games on the system. I've probably only played one of these games back in the 90's arcades like once or twice, as my parents generally weren't too happy about me playing shooting games in general, plus I always went for the racing ones anyhow! I did watch their demo reels a lot though and other players playing them. However my gameplay nostalgia for them isn't really a strong one and as such I played them recently with a fairly objective and clean sheet. Even though modern games have since surpassed everything technically in these titles, I really enjoyed playing through them. I clearly realise why they became such huge arcade hits. The home ports are excellent and a great reminder that the Saturn could pull off arcade quality if it received the development time it needed to be done properly. I had a blast playing these games, especially with a proper light gun and a old CRT that is required for them to work. 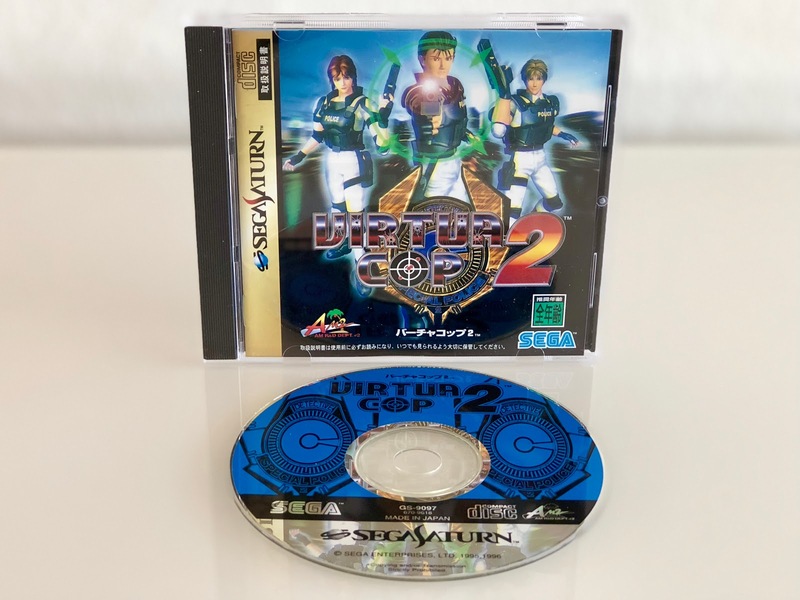 Recommended for anyone owning a Saturn and wanting to take part in those glory days of Sega's arcade 3D dominance.